You know that dish, that one dish that makes you like a food for the first time? THIS kale salad is THAT dish. So delicious, it not only convinced me to enjoy raw kale but also crave it. When I first had Andy Bellatti’s “Bow Down the Kale Gods” salad, it was prepared by Andy himself. A registered dietitian, food policy activist and a co-founder of Dietitians for Professional Integrity (check out Andy’s FB page here), Andy was visiting us for Thanksgiving when he made a generous batch of the amazing salad for our family dinner. I’ve been making it ever since. The most critical step in any kale salad, Andy explained, is massaging the kale leaves with salt for a couple of minutes. The salt softens the leaves and gets rid of that bitter taste most often associated with kale. Do this first and set the kale aside to allow it to rest while chopping the other ingredients and making the dressing. Andy’s original version also includes red peppers, dates or raisins, and avocado. 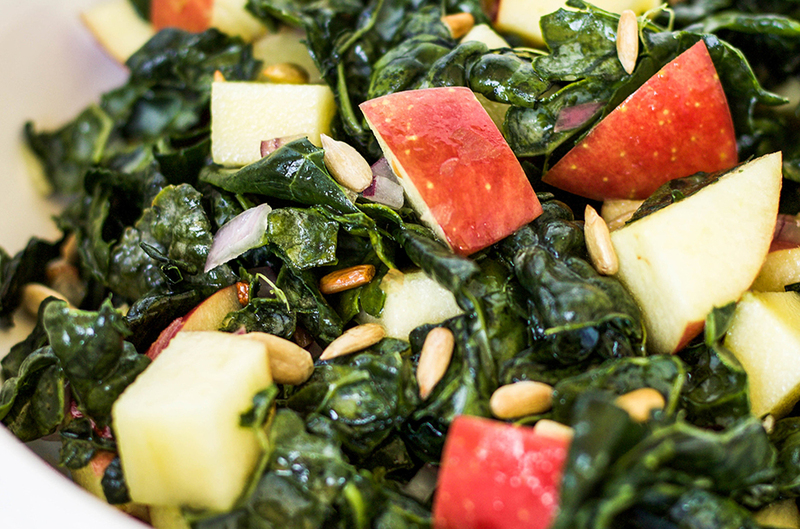 I’ve posted the modified version he made on Thanksgiving – with just the kale, apple, raw onion and toasted sunflower seeds. 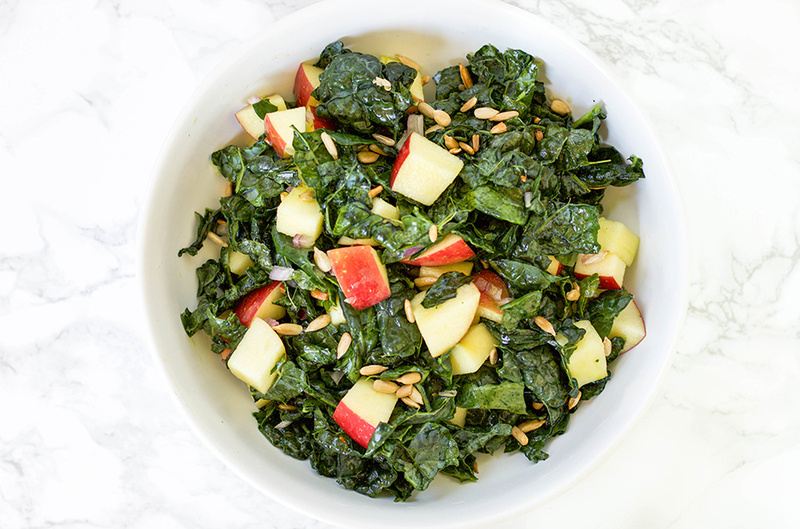 And, while you’ll realize there are no hard and fast rules about some ingredients (last night I added some pomegranate seeds to delicious effect), there’s something about the combination of the sweet, crisp apple and crunchy sunflower seeds that blends beautifully with the kale. One other ingredient that’s not in the original recipe is cayenne pepper. Andy added cayenne when he first made it for us, and it’s become a must. You can sprinkle the cayenne on the salad, but I like to mix it with the toasted sunflower seeds (after they’ve cooled). I’d like to rename this the “Bow Down to Andy” kale salad. After one small bite, I think you’ll agree. Wash and dry the kale leaves and remove from stems. Place in a large bowl and sprinkle with the salt. Massage the leaves with the salt while also tearing the leaves into smaller pieces until the kale softens – about 2 minutes. Set aside. Toast the sunflower seeds in a sauté pan on medium heat until golden brown, about 3-5 minutes. Allow to cool and sprinkle with the cayenne pepper. In a small bowl, whisk the lemon juice, olive oil and vinegar. 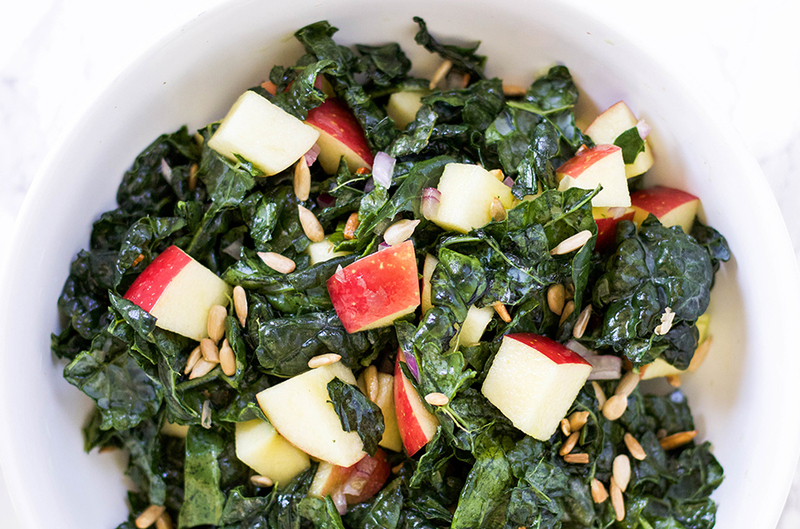 Add the apple, red onion, pomegranate seeds and sunflower seeds into the bowl with the kale and toss. Add the dressing and toss once more. Mary's Gone Crackers - one of my favorites! Don't dress all the salad. You'll want more tomorrow and it keeps well in the fridge for up to two days.